Impact Testers provide a method for evaluating the impact resistance of a coating to cracking and peeling from a substrate when it is subjected to a deformation caused by a falling weight. Both the coated or uncoated side of a panel can be tested to simulate indentation or bulging. Impact Testers have gained wide acceptance in testing the impact resistance of many types of coatings including paints, varnishes, plastic and laminates. They have also been also been widely used to establish quality control standards for resistance to impact surface damage and penetration of materials such as plastics, resins, fiberglass, sheet metals and plywood. 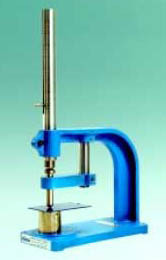 The tester consists of a solid base stand with a guide tube support. The guide tube has a slot that directs the weight and includes graduations to facilitate reading where the weight is dropped. The weights have build-in steel balls that provide different geometrical configurations, and the base of the instrument includes a die support. A specimen is placed over a hole in a die mounted in the anvil. The punch is placed upon the specimen. The weight is raised to the desired height in the guide tube and released. Damage to the sample is usually evaluated visually or with low power magnification. English Scale (max force of 28 inch-lbs). Evaluate materials that can be damaged or penetrated by small impact forces through normal use, such as products mildly abused in households, offices or labs. Metric Scale (max force of 100 and 200 kg-cm). This impact tester has gained wide acceptance in testing the impact resistance of many types of coatings, including paints, varnishes, plated, plastic or laminated coatings. It is widely used to establish quality control standards for resistance to impact surface damage and penetration of many construction materials including plastics, resins, fiberglass, sheet metals, and plywood. English Scale (max force of 320 inch-pounds). This impact tester was developed in cooperation with the Society of the Plastics Industry for evaluating impact resistance of rigid sheets of PVC (30 – 60 mils thick) and other materials exceeding the 160 inch-lb limit of the Heavy-Duty Impact Tester.